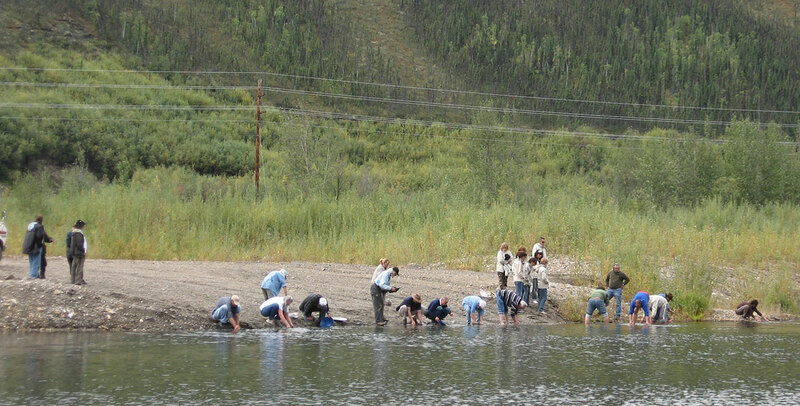 Our Creek gold panning area is located at the confluence of Goldbottom and Hunker creeks, in the “Heart of the Klondike” and is a few easy steps from our facilities at “The Roadhouse”. Gold panning is available at our camp site, anytime from 10 am until 6 pm, daily. We offer gold panning demonstrations throughout the day, so stop by and learn how to use a Klondike gold pan. Give it a try! Any of the Goldbottom Crew is happy to show you how to use the oldest and still the best tool for gold prospecting – a Klondike gold pan. Visitors are welcome to use their own gear; however we ask that it be confined to a gold pan only at this area. We have everything you’ll need to fulfill your gold seeking dreams, including instructions, rubber boots, gold pans, pokes and shovels. Finally, to keep things interesting, we also provide authentic paydirt for you to pan. You get the same guarantee we get as it is the same gravels we’re mining, sooooo… good luck! And have fun! Over the years we’ve been asked if there is anywhere to set-up a high banker or mini sluice and we’ve heard your pleas. We have 69 placer gold claims along Goldbottom and Hunker creeks. This activity is intended for the more serious “hobby” miner and we have restrictions as to what we consider a “hobby” miner.Remember that it’s not finding the gold, it’s seeking the gold! We promise the setting is awesome, the adventure is real and the gold is a glorious bonus!